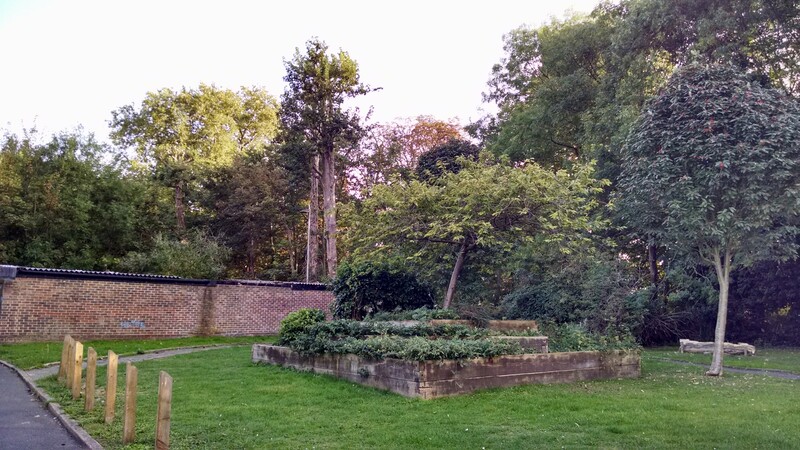 Last day to respond to Ravensbury Regen plans! See our newsletter attached. Don’t forget that today is your last day to respond to the Merton regen proposals. No matter what your opinion might be, we would encourage you to respond to the overall design as it will change Ravensbury forever if it goes through unchallenged. The scale of the development is immense for the area and it appears that there will not be any more social housing provision than there currently is. Ravensbury Estate is next to the River Wandle so all these extra buildings and paving areas will serve to further compromise our area in the middle of a flood zone. Plenty of trees also will be removed both inside the regen area and outside. Hengelo Gardens and Ravensbury Grove will significantly change if these proposals go unchallenged. Have you seen the yellow notices on Ravensbury Grove? 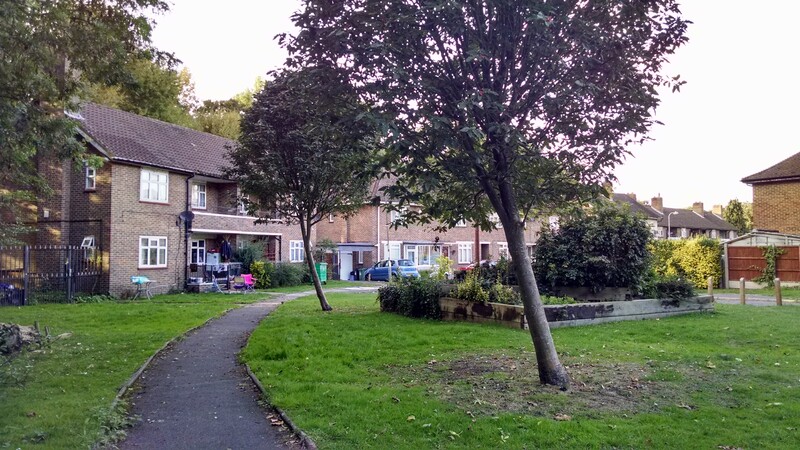 They are asking if you are happy with the SUSPENSION OF PARKING along parts of Ravensbury Grove, Hatfeild Close and Hengelo Gardens permanently. The Merton Council planning committee waved the Ravensbury Garages plans through recently. Councillors that thought the plans suitable (supported the application) included: John Bowcott (Conservative), Najeeb Latif (Cons), Andrew Judge (Labour) , Linda Kirby (Lab), Peter Southgate (Merton Park Independent Residents), Imran Uddin (Lab), Geraldine Stanford (Lab), Joan Henry (Lab). Application 16/P2354 has differing dates online vs on actual notice! As you know, we don’t have long to respond to the SECOND part of the planning application made by Circle that requests suspension of parking on Ravensbury Grove for TWO years! 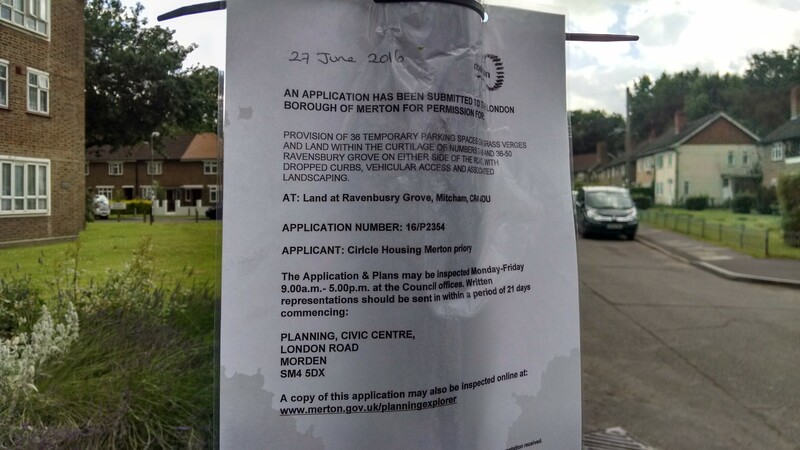 If you zoom into the above image of the actual planning application notice, you’ll see that it states 27th June 2016 as the date of the application notice. This is when the council erected the notice for residents. This would usually give until 18th July 2016 for residents to respond. However online, the application date is actually given as 17th June 2016. So, online they have given the last date for residents comments as only 12th July 2016. Essentially, this gives residents one week less to respond. We have emailed Merton Council for a response. Here’s a few artist’s 3d render impressions of how the Circle Housing Merton Priory Homes proposals will look. 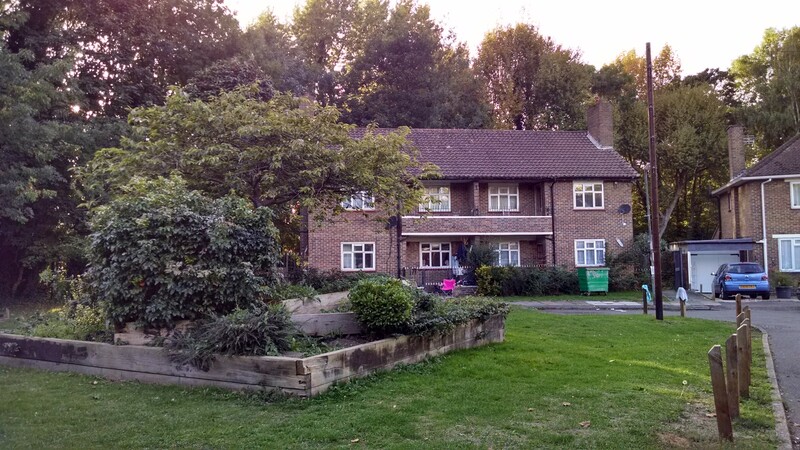 We think that planning should be refused because one of the 4 storey flats will occupy an important green space that fulfils the role of public amenity, a transition area between park and estate that is vital to the character of Ravensbury and defines our relationship with Ravensbury Park. 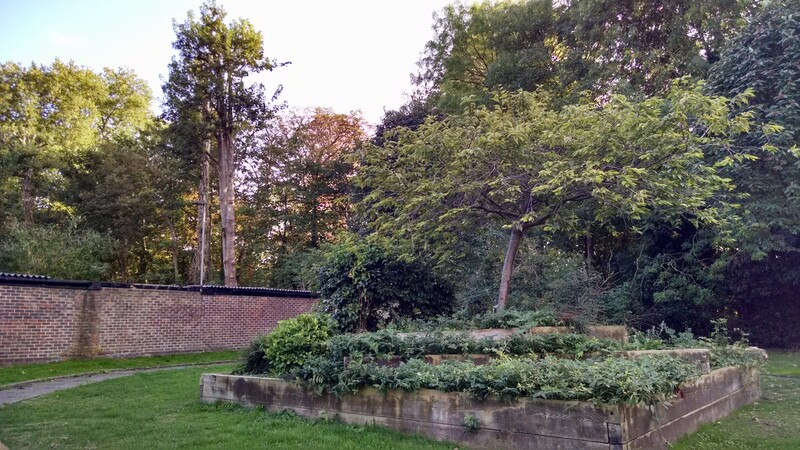 The existing view of Ravensbury Park seen from Ravensbury Grove will be lost forever. They also intend to remove all existing trees within the site boundary. We think that Block B should not be built at all because it robs Ravensbury of a unique relationship with the park, permanently affecting the character of our area. The river houses and Block A in the plans should be shorter too. We think the height of the flats and riverside houses will dominate the treeline when seen from within Ravensbury, therefore we would request that planning be refused in this instance. The style of the flats could look better with Mansard roofs not flat roofs. The ground in the garages is higher than the rest of Ravensbury so all the new buildings will be about 1m higher (half a storey) and so have a greater impact.